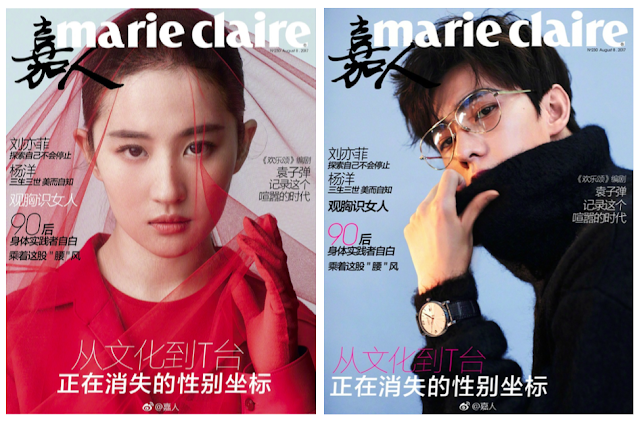 I thought that Elle's lovely ensemble featuring Yang Mi, Cecilia Liu and Jing Tian was impossible to beat, but Marie Claire has an equally enviable lineup as it has snagged goddess couple Crystal Liu and Yang Yang for their August Issue. Parts of the interview have been translated below including questions on their upcoming movie Once Upon A Time. Q: What kind of a person is the heroine in Ten Miles of Peach Blossoms? A: Its's a drama from a woman's perspective, powerful enough, and there's a lot of room to develop. 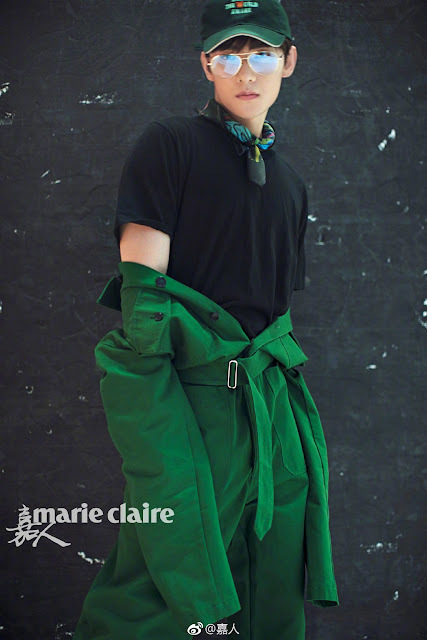 Q: Between Yehua, Mo Yuan and Li Jing, who will you pick in real life? A: Yehua, he really is quite a perfect character. Q: What do you consider to be relaxing? A: I'm quite happy when I work, on the flip side, if I'm forced to stop working for a while, it's easy to feel out of your wits. When I'm resting, I just play with the cats, read books, go running and watch movies. Q: When's the most recent vacation that you had? A: Last month, I went to Thailand to attend a classmate's wedding and reminisced about many things from our school days. Sitting in the study with a cup of tea is also relaxing. When I don't have to go out, I can stay indoors reading books for days. Q: As a 30-year-old woman, what are your plans for the future? A: The person you want to become, once the very definition is gone, it's actually all watered down. Take Stanislavski for example, he certainly didn't become a performer, wrote a book and spent 40 years studying it just because it was what everyone expected of him. That thing is in our own psyche and it doesn't need to be glorified by a label. Only one thing shines brightly, the rest are just incidental. If you want success, flowers and applause, pursuing it directly will not work, it has to be that you created something valuable. As for me, it's to be a good actress, to be able to discover all kinds of human nature. Q: In one year, what is the time that you must leave for yourself? A: I will request to take a month vacation after working straight for a few months to travel, workout and spend time with friends. Let the crew be unable to find me -- this will help me feel free. However, this "one month" is very hard to get, I have to exhaust all methods with the crew. Q: What do you collect? A: Shoes, at least a hundred pairs, mainly for how the visuals. Also more than ten watches. I normally don't have a chance to wear them during filming but I will bring two to three to the set and display it by the door along the entrance to my hotel room where it's visible. Q: What have you done that was out of your comfort zone? A: I have a fear of the deep sea, but I wanted to see if I could overcome it so I went diving. After going for about fifteen meters, my heart felt uneasy and I was quite scared, I kept gesturing with my thumb to the instructor: Up, Up! Q: Who is your movie goddess? A: When I was young, it was Gong Li, now it's Natalie Portman. 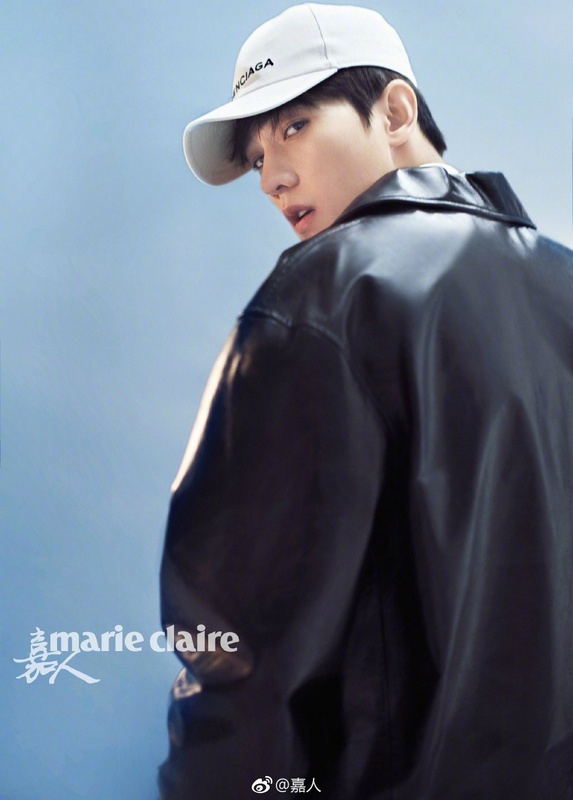 Q: Between Bai Qian, Feng Jiu and Su Jin, who will you choose in real life? A: Still Bai Qian because it's fate. Q: If you weren't an actor, what would be your profession? A: A dancer or a pilot. I am drawn to the feeling of flight and have always thought of one day flying a plane. Q: What is your weirdest habit? A: Does OCD count? For example, if there are a few books on the table, I wouldn't be able to resist arranging the books neatly towards the edge of the table. Interesting interviews! Thanks for posting them.